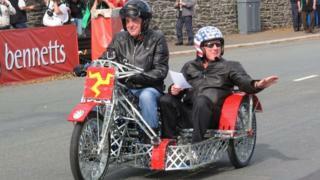 Top Gear presenter James May has completed a lap of the Isle of Man TT course on an electric-powered motorbike and sidecar made from Meccano. May and fellow TV presenter Oz Clarke started on Wednesday and had to overcome a series of mechanical issues on their lap of the 37-mile course. He said: "It is a great honour to have done it." The challenge will be broadcast on the BBC2 programme Toy Stories to be aired this Christmas. The programme sees James May explore the capabilities of toys from his childhood. The bike was made using thousands of pieces of the children's toy. May continued: "We reached 25mph coming down the mountain - according to the pace car. "There was a certain amount of flexibility and a couple of minor problems with bearings, steering, comfort, electricity and the passenger, but apart from that it was a very smooth run and very heroic I think. He added: "It is lovely to be here on the Isle of Man and everyone has been extremely helpful, encouraging, hospitable and kind. We will be back." The team completed their epic lap in front of a packed grandstand on Glencrutchery Road in Douglas. The lap coincided with the 90th anniversary of the island's Manx Grand Prix, which is held on the Isle of Man's Mountain Course.